Our goal:"To provide backup services in the event of major emergencies and to assist at Community events." 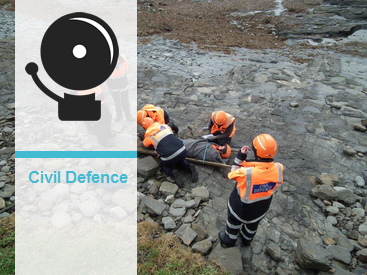 Civil Defence is an organisation comprising almost entirely of volunteers. It's prime role is to give aid and assistance in time of emergencies in support of the professional emergency services. Members attend classes in many disciplines, such as life saving skills, First Aid, Search and Rescue, Fire Fighting, Water Rescue, Radiation Monitoring, Radio Communications, and looking after the welfare of those evacuated during an emergency. Sorry, there are no Civil Defence Publications available at this time. Sorry, there are no Civil Defence Forms available at this time. Sorry, there are no Civil Defence FAQs available at this time.